Technological Advancements that are Second to None for Better Outcomes. The Moakley Ambulatory Surgery Center at the Boston Medical Center features the most sophisticated operating rooms and the latest, most advanced surgical equipment in the country. Six ultra-modern surgery suites, two of which are designed specifically for orthopedic procedures, and one special procedure room, are at the heart of the Moakley Ambulatory Surgery Center. Virtually every modern surgical advancement is available to doctors and patients—including high-tech cameras and built-in imaging systems – which allow for smaller incisions, more accurate and less-invasive procedures, less discomfort, and dramatically shorter recovery time. Advanced pain management techniques are available and customized for every patient to increase comfort and lessen side effects. These include the use of short-acting, fast – emergence (SAFE) drugs for general anesthesia, aggressive use of local anesthesia, and the use of ultrasound to more accurately pinpoint the area for a nerve block. Because the Moakley Ambulatory Surgery Center is connected to Boston Medical Center, the full services of a major academic medical center and overnight health facility are available if needed. So you get the best surgical care, technologies, and facilities at BMC—plus added peace of mind. Advanced anesthesia techniques and pain management for comfort, faster recovery, and discharge. Exceptional Hospital Care in a Soothing Setting. At BMC, we believe the more comfortable and relaxed patients are, the better their surgical experience and shorter their recovery will be. That’s why the entire Moakley Building – including surgical suites, waiting areas, and patient rooms—is warm and inviting. High windows provide a cascade of natural light and give a feeling of openness, while warm lighting, comfortable furniture, and pastel wall colors reflect a soothing ambiance. To reduce anxiety, surgical and medical equipment is out of sight, while a highly advanced communication system eliminates loud announcements. Family and friends can gather in specially designed waiting areas. You will need the Adobe Reader to view and print the above documents. 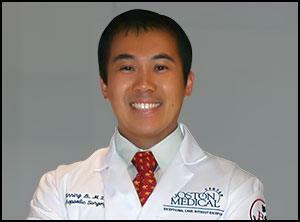 Dr. Li sees patients at both the Ryan Center for Sports Medicine (Tuesday) and the Shapiro Ambulatory Center (Wednesday).